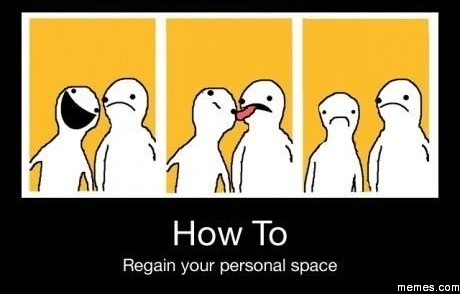 Pet Peeve… stay out of my personal space! Once upon a time when I was a wee lass of 13, my girlfriend and I had this morbid curiosity about funeral homes. We wanted to see a dead body (yeah, yeah, yeah, I know… sick). We would walk past a mortuary every day, and our curiosity grew and grew. Then we came up with a silly story that we were doing a report for school on death and funeral homes, hoping we could get a tour of the mortuary (no, I don’t know what we were thinking back then, but we both turned out perfectly normal, I promise). The funeral director was more than accommodating. He was so kind, gave us a tour of the front of the mortuary (no dead bodies), took us into this conference room and talked to us about life, death, and “personal space.” That little experience satisfied our morbid curiosity forever (even though we didn’t see a dead body) and I had a fabulous lesson on personal space that has stayed with me ever since. For those who aren’t aware, personal space is the region surrounding a person which they regard as psychologically theirs. 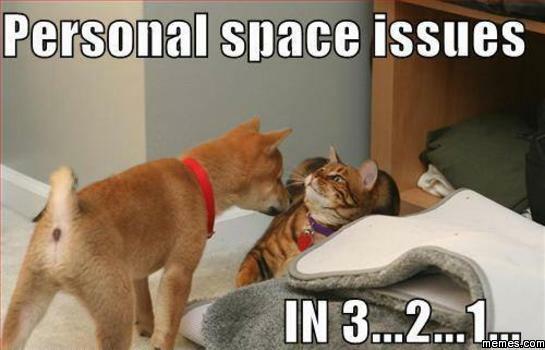 Most people value their personal space and feel discomfort, anger, or anxiety when their personal space is encroached. I, myself, get angry and irritated. My son likes to constantly invade my personal space and stand super close to me… not because he’s obnoxious, but because I’m “Mom” and he doesn’t get that there are personal boundaries yet. I get annoyed and irritated and tell him to back up a bit, or quite frankly, “get out of my face.” This tells you just how serious I am about not having my personal space invaded, that even my own child needs to keep an appropriate distance unless we’re giving/getting hugs or kisses or snuggles. This morning I went shopping. I was in the process of checking out, and this woman who was behind me made absolutely certain that her cart remained about 2 inches from my body at all times. If I moved an inch, she made sure she moved her cart an inch as well… the entire time. I felt my anger and blood pressure rise and keep rising during my check-out process. All it would’ve taken was one small movement with my hip and that cart would’ve gone smashing right back into her. But I maintained, left without causing an incident, and cussed her out the minute I got into the car where no one could hear me. SOUND OFF!! Do you have any silly pet peeves that drive you to absolute madness? How do you handle it when it happens? This entry was posted in Life in general and tagged anger, annoying, blog, creative writing, crowds, life, personal space, pet peeve, stress on October 24, 2015 by Paula. Usually just keep it inside, there are always going to be things that drive us crazy! Great post. My biggest thing is tapping! It drives me crazy!! People that eat, chew, or smoke way too close to my face or ears…or lean into the personal space while eating, chewing, or smoking grrrrr….that, and the stripes on the comforter not lining up straight when I go to lay down 🙂 hahahahha, the last one’s an inside joke y’all..!!! OMG, smoking in the recovery area after a race!!! … Hahahaha…. only solids from here on out!!! yeah, remember that guy, really!!! I’m also very big on personal space but one thing that bugs me are unnecessary noises like tapping, humming, and whistling that isn’t a song. Ohmigosh, I know! The children just don’t understand yet, but they will one day. My son is really big for his age and tries sitting in the same chair with me whenever he can. Drives me nuts, hehe!! They probably wont get it until they start needing their own personal space more…then we’re going to miss our lil space invaders!!!! I am with the lot of you on personal space – not with my kids, though, but then again, they let me invade their personal space all the time, so that would really be a double standard. I used to have very long hair and usually tied it in a high ponytail. That was great for reclaiming personal space in line for groceries, tickets ect. Just a flick (“Oh, sorry. I didn’t see you there), and people would keep their distance! I once turned to someone bumping into my heels with a low cart in IKEA and said “Oh, I am sorry I was in your way!”. That REALLY did the trick! Yes, indeed!! That’s as bad as nails on a chalkboard sometimes, isn’t it!!! Hahaha! I never thought about that, the snow!! It is annoying, isn’t it!